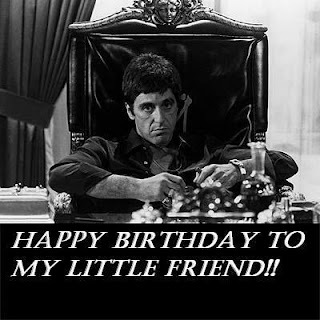 Today is a very special day for my very special friend. HAPPY BIRTHDAY MIMSEY!! 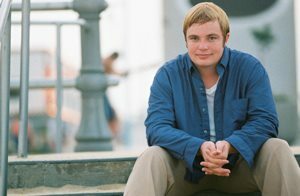 So, to celebrate this very special day with my very special friend, I decided to let him take over the blog. Okay, I'll admit, there was a little blackmail and slight arm twisting involved (the photos are quite scandalous!) but he convinced me in the end. Jay: Hello Two-Cents Readers! Ho! Ho! Ho! Tams: Ho, Ho, Ho indeed! blog of my good friend Tam’s Book Blog! 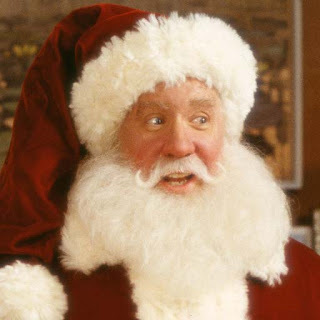 In celebration of The Five Santas here’s “Mimsey’s Five Favorite Movie Santas”! 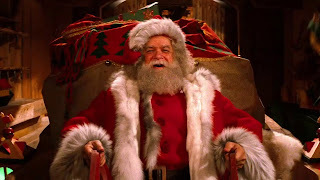 Now, before we begin, I should say I’m sticking only to live action Santa’s and only in movie’s. The Grinch and that Dog are hilarious. But, I’m just including live-action peeps in this post. 1) David Huddleston from Santa Claus: The Movie. Let’s go boys! From the 1985 movie by the same name, this flick is actually one of my favorite holiday films. 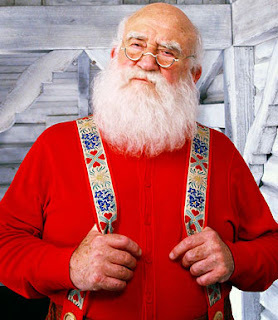 Santa Claus, and bring happiness to children everywhere. 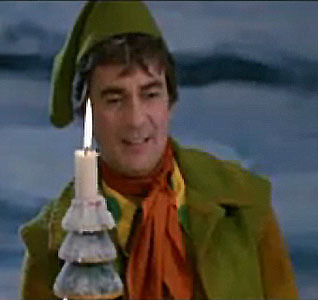 Jay: Santa chooses a forward thinking elf named Patch, played by Dudley Moore. And his amazing hair! Tams: at least he's not drunk! makes you believe in Santa Claus. Jay: Seriously, John Lithgow turns the evil up to 11 in this flick. Tams: evil, schmevil. You should have seen him in Raising Cain! 2) Edmund Gwenn in Miracle on 34th Street. The guy just looks like he farts candy canes and poops gum drops. Department store. 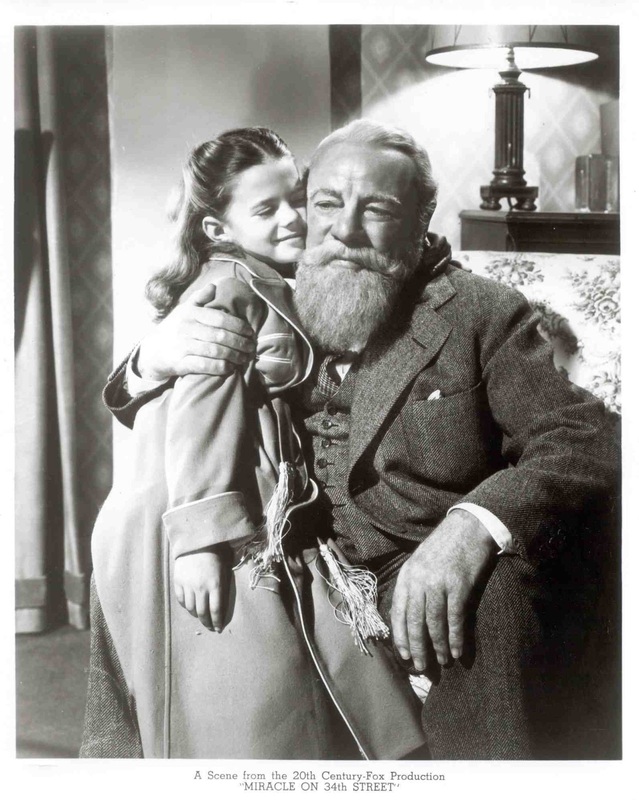 He takes it on himself to convince one little girl, Susan, played by Natalie Wood, that Santa Claus is real. Jay: Psssstt: Natalie Wood is the one on the left. Santa. He’s 100% genuine, loving, and authentic. I would give this man ALL THE COOKIES! Tams: I'll give you this one, but I'd pay good money to see him poop gum drops! The movie is about a lovable Elf named Buddy, played by the quiet and reserved Will Ferrell. 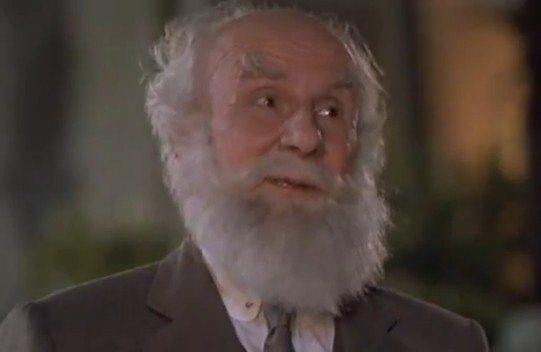 movie with the hidden depths of Santa Claus: The Movie. 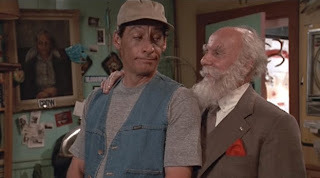 Jay: That’s the happiest I’ve seen Ed Asner be since he was drunk that time on The Mary Tyler Moore show. Tams: I loved MTM drunk Asner! 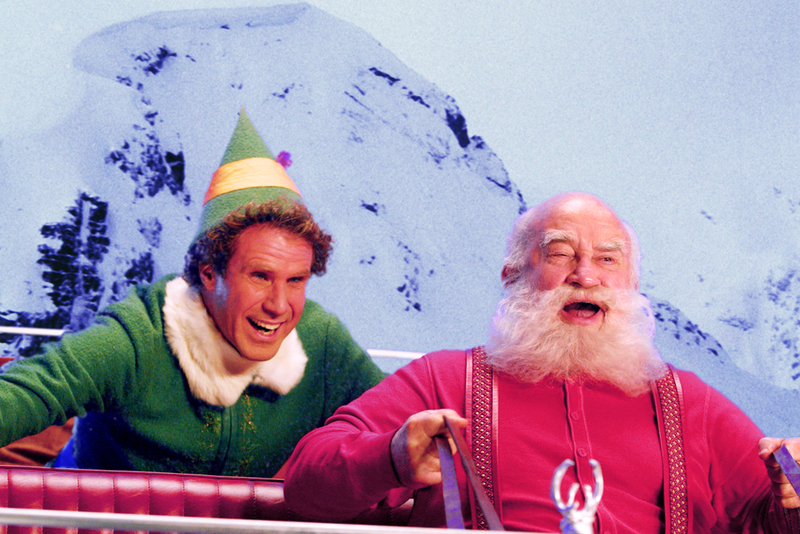 Jay: The movie has a lot of heart, some great throwbacks to classic Christmas specials, and it’s probably one of Will Ferrell’s best movies. Tams: ick, I do not like Will Ferrell. I’ve reviewed this flick elsewhere as part of this blog hop, but one of the really fun things about this movie is how human and flawed Allen’s portrayal of Santa is. 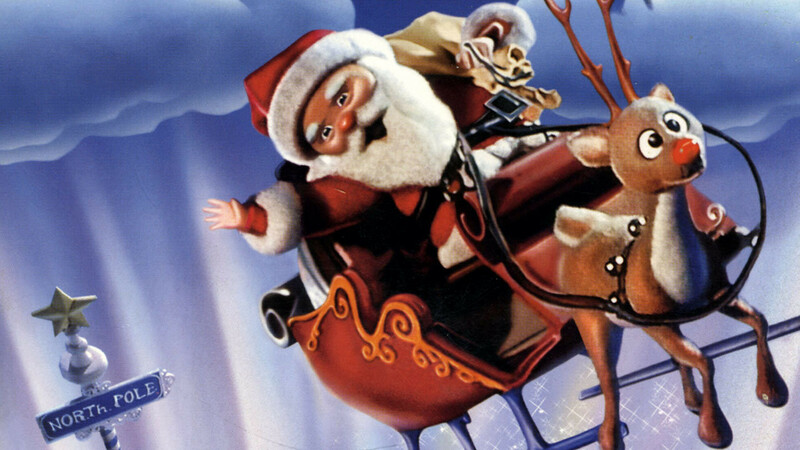 He’s a guy who falls into the job, by having the previous Santa fall off his roof, and it’s not something that comes natural for him. 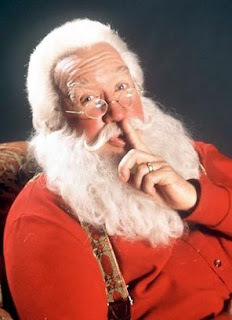 Part of the enjoyment of watching this film is seeing The Tool Man slowly grow into the role of Jolly Old St. Nick. Jay: I can’t stop hearing him do the grunt. I’m sorry. least appreciate what they were going for in the third film. Tams: I loved how he brought a little bit of Tim 'The Tool Man' Taylor to this role. Jay: I’m pretty sure I’m getting an Allen Wrench in my stocking this year. Little known fact, this guy also voiced The Sultan in Aladdin. He is adorable incarnate. P. Worrell. I’ve seen all the movies, I love the commercials, I even enjoyed the TV show. And at least once a year, I really look forward to watching this flick. I would watch a movie with these two going on a road trip. 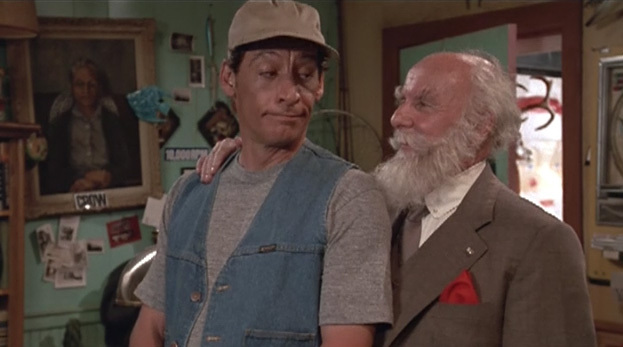 have touch’s of Tim Allen’s flawed humanity and the overall adorableness of Edmund Gwenn’s Santa. 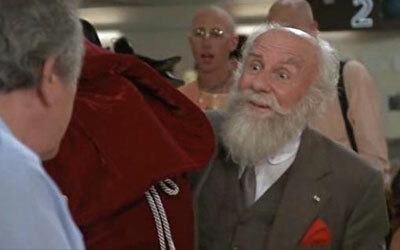 The whole movie is about Seale’s Santa getting older, and realizing it’s time to pass the torch. There’s way more heavy emotion and subtext then a lot of people give this movie credit for. Jay Mims is a jolly bearded elf in his spare time. He’s trying to convince the three Shetland ponies to pull his sleigh. He sometimes wraps presents with his passive-aggressive Dalek roommate named Steve. He writes books and is far funnier on facebook then in real life. He is terrible at Twitter. His next book "The Gray Ghost Inn" is due out October 15, 2013. For a regular dose of Mimsey, check out his blog. Rafflecopter contest! It’s Christmas In July and we’re giving away FIVE PRIZES! Loved Ed Asner!! Such great memories seeing those. Love anything Christmas! I will watch any Christmas movie any time of the year. This is a new-to-me author with cool new books to add to my TBR! I am really looking forward to reading them! Thank you! Never have read your books but look forward to reading them. 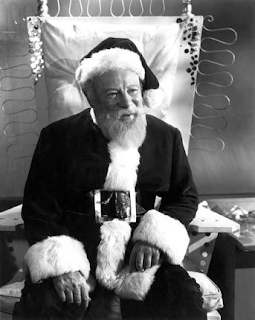 Edmund Gwenn was my favorite of the five but anyone who plays Santa cheerfully does a good job. Love Christmas shows any time of the year. Thank you.